I'm trying to get my players into the great outdoors. I'm trying to make a sandbox that will allow them to experience lots of different terrains that feel different. I'm finding it a lot of work because I'm building it from scratch. 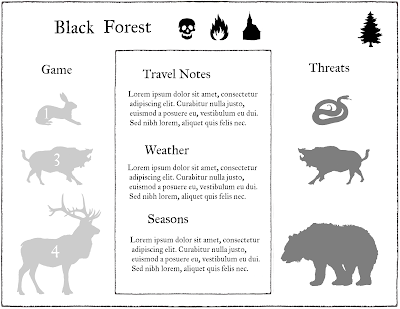 Seasons, weather, travel rates, encounters there's so much to decide about a terrain and then convey to players. Here's an approach I think I'm going to try. Rather than have all the season rules in one place in the rule book and the travel rules in another, what seems more relevant is to show the players all the rules that apply to where they are (or are soon going to be). A single page with every thing you need to know about that terrain. Well not everything. I can't fit all this stuff and the special travel challenge mini-game too. But maybe that can be on the back of the same piece of paper. I'll have a better idea of what sections I need as I try to make more terrain. For now, the mockup shows the most common threats on the right and the most common small/medium/large game animals on the left. The game animals are for use with Talysman's cool Simple Hunting rules. Also with my survival rule of one hit die yielding one ration of food. This will give you an idea going in what dangers to be on the look out for and what the possibilities for living off the land are. Some terrains may have no game animals at all-- blighted lands and such. Also note with the mock up that one of the food options is also dangerous. One of the benefits of silhouettes is that they can convey information even if small, so there isn't really a need for these to be so big. I like it aesthetically. You could make them smaller and fit more monsters/animals on but I wouldn't want to over due it. These might be just those folks know about. Other mysterious dangers could be encountered. 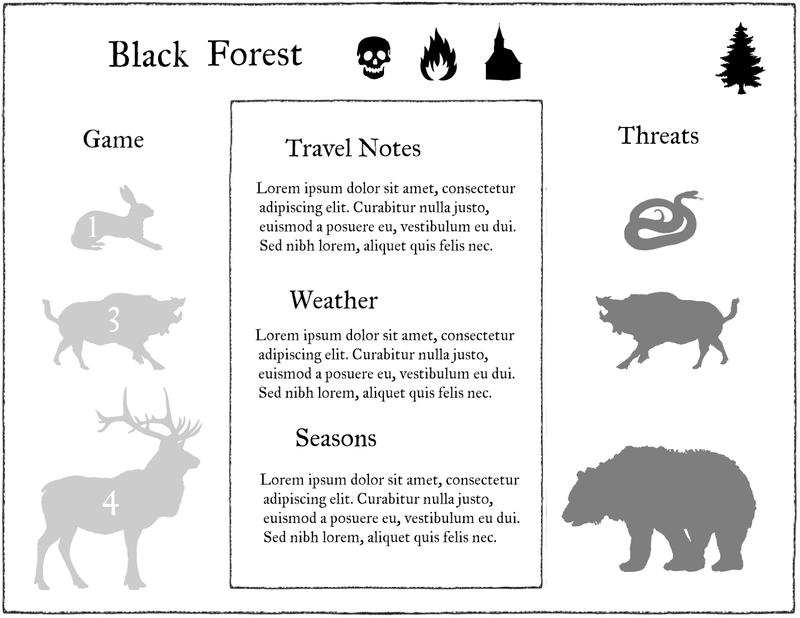 The middle section is for any special notes about travel, seasons, and weather particular to this type of land. I put a row of silhouettes by the name. They don't mean anything. But I was thinking if there were certain categories of information that come up again and again maybe they could be iconized to make things simpler. So, maybe for these three it could be: yes the plague is here, threat of fires, and villages present (or maybe small rural settlements not even of village size). Of course this might all seem silly and obvious in a "the forest has trees" type of way. But it might not be for your Burning Tire Wastes or Crystal Deserts. And if nothing else it's helping me as DM sort out in my head how to differentiate this terrains in a simple yet interesting way. Let me know you thoughts. Yeah, this is a great idea. I wonder though: shouldn't some of that information be discovered in disaggregated form? Or do you just assume that characters know all of this info by default? What about a unfilled worksheet that has placed for players to discover threats discovered (or something, I'm just throwing out ideas here). I'm really interested in seeing what game effects you build out from weather and seasons, because I do that very fast and loose right now, based on a 2d6 reaction roll with the heavens (modified by season and recent weather). Just having a list of blanks to fill in when thinking about a region/biome is useful. Maybe add something for resources that the region can produce? Lumber, mining, particular kinds of sorcerous components, and so forth. Have you looked at An Echo, Resounding? That has some interesting tools for building regions too, though it's biased toward political considerations, as it is also a mass combat system. Looks good, love to see more. Just a note: you can eat bear, I've had it a few times and it's tastes pretty good (young bears tatse better). @Brendan: Yeah, I'm not sure myself. I like the idea of "fill out what you find out" sheets. But I also like the idea that these characters that presumably grew up in the area know *something* about the land. Maybe, I could roll at character creation which terrain you grew up in and your character is privy to that? Or maybe after spending 2-7 days in a terrain you get to see the page? And yeah, still need to think about weather/seasons. Seems like the obvious effects would be movement rate adjustments and exposure problems. But if a terrain varies enough in seasons it might even warrant a separate terrain sheet. Like a Black Forest - Winter. Noting resources for both domain level play or for trading systems is a great idea. I've only heard of An Echo, Resounding, but didn't know what it was. @JDJarvis: Yeah, I was thinking about that. You could eat snakes too. But maybe these are just the easiest to find at that size category, in other words elk are more common than bear. Or it could be these are the best game choices at that size level. So an experienced hunter would rather go for elk than tangle with a grizzly. So in this forest, while boar are dangerous, they are they best thing going for mid-sized creatures. One thing I was thinking too, about game was that, while easy to remember, the 1 HD = 1 ration rule is pretty damn paltry. Maybe it should be 1 HD = 2 rations at least. One HD per ration is a little skimpy. Game yields about 35-50% it's weight in food (modern hunters dscard stuff old time folk wouldn't) a 100 lb animal would thus supply 35-50 lbs of food. That's about a weeks worth of food for an active man. HD to game weight doesn't map cleanly but a week of rations per HD might do the trick. Ooh, thanks JD, I love it when someone with specialized knowledge comments. I think the elk probably should have had more hit dice than 4. Looking at Wikipedia a cow is ~500lbs, a bull maybe 1000lbs or more. So that bull would feed a party of 10 for a week. Which almost makes the hunting mini-game a non-issue. But, what about the fact you are butchering it on the trail and there is no refrigeration? Would you cook all the meat you could and leave the rest, or drag along the carcass and cook it at intervals? I suppose having a bunch of raw meat might draw predators/encounters. How would you rule it, if your party just took down an elk? One easy fix might be to base 1 ration on a week's worth of food for 1 person rather than a day, but assume that fresh meat is more encumbering than prepared travel rations. Day by day rations are probably only really useful when feeding to monsters, right? And in that case, you can mark off fractions maybe. I have to admit I have the party track days of food when in the wilds. We've had more then one session where the party had to limp back to civilization hunting and foraging along the way. Hunting while travelling is for small game that might forestall the use of accounted for rations for a day. Spending 2 oe 3 days hunting, and preparing food for travel has happened now and again. I figure for a meat heavy diet 5 pounds a day and without spending some time for food perp itks not lasting past 3-4 days.